This article is a review about arguably one of the best chlorinators on the market today. Read on to learn about this fantastic unit. For further product and purchasing information please visit SGS Breeze 540. 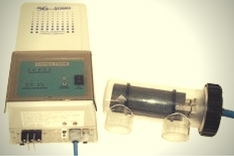 The Breeze 540 is a saltwater chlorine generator from Saline Generating Systems (SGS) based and operating in the United States. This particular salt water chlorine generator boasts of exemplary performance, durability and is so easy to use. This unit is capable of sanitizing pools with a capacity of 40,000 gallons of water which is perfect for most residential pools out there today. The Breeze 540 will provide you with clean, clear, soft and refreshing pool water – hassle free. In terms of performance, this unit is designed to offer reliable and sustainable pool chlorination. The Breeze chlorinator ensures that your pool is continually supplied with a mild and safe form of chlorine that prevents the water from being poorly or overly chlorinated at any given time. The unit requires minimal maintenance as it comes with an inbuilt descaling functionality that reverses polarity each 6 hours of operation. This significantly reduces accumulation of residue meaning that you will rarely need to clean out the unit yourself. Although in case of heavy build-up (which can occur due to hard water conditions) the unit’s plates are properly spaced out for easy cleansing using a special cleaning tool that is bundled together with this unit. The unit’s cell is placed strategically in a housing which is see-through to allow for easy and convenient inspection. Cleaning the cell is quite easy and you do not need to use any form of acid solution to get residue (normally calcium build up) out. This means that the cell’s life is greatly extended and you can continue to have super clear, luxurious and soft-feeling water all year round. Its user friendly interface and controls makes the SGS Breeze 540 the perfect tool to regulate chlorine levels in your swimming pool. The user interface is composed of a one touch control center that is engineered to operate even under the most extreme conditions. The control unit is simple and easy to use. There are LED indicators that clearly show the current operating status of the unit. This unit comes with a 5 year warranty when installed by a professional. This is a clear indicator that this unit is capable of offering you the chlorinated pool water for many years without any operational troubles. The chlorinator offers a simple and easy solution to keep your pool water clean and fresh. The unit is designed with homeowners in mind. This SGS chlorine generator offers the best performance and the longest warranty of its kind.